For those of you who plan to be in Vancouver at the end of July (and who wouldn't want to? ), the 43d International Conference on Salishan and Neighbouring Languages will be hosted by the Squamish Nation and Capilano College in North Vancouver, Friday July 25th and Saturday July 26th. Further information is available at http://icsnl.org. The conference's odd name is due to the fact that it has historically focussed on Salishan languages but is intended to include the various other languages of the greater Pacific Northwest region. Talks on Athabascan languages nominally fall within its purview but are relatively rare since we Athabascanists have our own conference. The Dene Languages Conference meets in Cold Lake, Alberta next Friday and Saturday. I don't think there's actually a rule, in English at any rate, or at least a simple either-or rule, to govern the choice between the singular and the plural. The choice depends on the mental picture that it evokes. That in turn depends on whether the subject of the sentence, though plural, is viewed aggregatively or distributively. The "virgins of Jerusalem hang down their heads" sounds fine, but so does "In prosperous days They swarm, but in adverse withdraw their head." The difference is that the virgins are acting collectively, in unison; the swarmers are not–nor are the ostriches when they bury their heads. Each ostrich does that separately, individually. So the reader thinks of an individual ostrich, and he (or she) has one head. But the virgins are thought of as moving their heads in unison–a bunch of heads moving at once. This is an interesting analysis, but as a description of general usage, I don't believe that it's accurate. Paul Krugman's observations ["Home Not-So-Sweet Home", column of 23 June] about our uncritical bias in favor of home ownership and the widespread attitude toward home renters as second-class citizens calls to mind an exchange I had several years ago while ordering a pizza. When I told the delivery dispatcher my address, she asked, "Is that an apartment or a home?" I still don't know what the right answer would have been, though the pizza did arrive. I was at first baffled by Bloom's bafflement, until I realized he was understanding home to refer one's domicile, the place where one lives, which could be either a house or an apartment (he might also have been assuming — contrary to fact — that apartments are only rented rather than owned, but this isn't clear from his story). The delivery dispatcher, on the other hand, was using home to mean 'house', and was asking whether the delivery was to be made to a residence accessible from the street or whether the deliverer would have to gain access to the interior of the building. In today's Boston Globe it's my honor to pinch-hit for a vacationing Jan Freeman, who writes a fantastic weekly column called "The Word." I took the opportunity to write about a word popularized by the new movie "Kung Fu Panda": skadoosh. Or is it skidoosh? Or maybe skedoosh? The reference of course is to the legend that ostriches when frightened bury their head in the sand. It is pure legend and a canard on a very distinguished bird. [W]hile we are debunking canards (which, by contrast, are birds that can fly), allow me to question the use of the singular "head" in the following sentence from Judge Posner's opinion: "The reference of course is to the legend that ostriches when frightened bury their head in the sand." Dear Prof. Bashman, to say "ostriches hide their heads in the sand" would imply that each ostrich had more than one head. In this case, my own intuitions are on Mr. Bashman's side. Under the theory that each ostrich has an individual and unique head, different from those of other ostriches, the phrase "Ostriches hide their heads in the sand" seems entirely appropriate, whereas "Ostriches hide their head in the sand" raises distracting questions. What is this head? Perhaps it's the shrunken head of a lion, handed down from their heroic ancestors; or perhaps this phrase refers to their elected or hereditary leader, the Head Ostrich, who must be protected in a siliceous bunker. But as you know, we don't privilege any one person's linguistic whims, not even mine. Instead, let's look at the precedents. One of our several goals here at Language Log Plaza is to help non-linguists understand the ways language is important in most (probably all) of our lives. A quick look at the categories we write about is evidence of this–language and science, education, advertising, politics, psychology, media, humor, law, etc. Since the role of linguistics in the legal area is one of these, I thought I'd call attention to a recent amicus brief that a few linguists helped a lawyer construct (see also here). Neal Goldfarb, at Tighe Patton Armstrong Teasdale in Washington DC, had a strong concern about the statutory interpretation of a case before the US Supreme Court, US v. Randy Edward Hayes, and so he asked a few linguists and cognitive scientists to help him with his brief. Interestingly, this brief doesn't take a position on the legal questions before the Court. Instead, it presents some linguistic insights that differ from the usual modes of legal argument in the hope that lawyers and judges might begin to pay more attention to linguistics. "Are you a different person when you speak a different language?" That's the headline of the press release, released from embargo on June 17, describing David Luna, Torsten Ringberg & Laura Peracchio, "One Individual, Two Identities", Journal of Consumer Research, August 2008. The press headlines (not many, so far) echo the same idea: "How Switching Language Can Change Your Personality" (Reuters and New Scientist, published at ABC News); "Switching languages could cause you to switch personalities" (Discovery Reports, Canada); "Change in language alters personality" (IT Examiner, India — subhead "Oh, fickle woman"); "People switch personality with language" (Times of India); "For bilinguals, a distinct personality for each language" (Agence France Presse). Many Indians consider American English infra dig. But it's time we got over this distaste. A recent survey has found that people unconsciously switch their personality when they change languages. Since American English is by far the most dominant language today, anyone who wants to be a confident player in a globalised world has to speak the American lingo. But in fact, as the press release and most of the articles explain, it's only bicultural individuals who were found to change their personality when changing languages (where "bicultural" means not identifying strongly with the dominant culture of either language). And it was only certain bilingual individuals who were studied: Hispanic-American women living in Milwaukee, Wisconsin. And it was only certain aspects of their personality that were measured: degree of self-sufficiency vs. other-dependence, along with some related gender-role associations. And (as the press release and the articles don't tell us) those aspects of their personality didn't change all that much. Why does Billy find this weird? My French is up to most basic communication needs, but my husband's isn't, so we shopped around a bit for a phrasebook to help him maximize touristic enjoyment while I linguistified. We found four suitable candidate pocket phrasebooks. One cost 5 euros rather than 7. It also happened to be the one that included the all-important phrase, "Je voudrais cinq tranches de jambon, s'il vous plaît", without which phrase one cannot navigate Paris at all. But the main deciding factor for us, besides the extremely valuable euros, was the pronunciation guides. Facebook phases out singular "they"
June 27, 2008 @ 11:34 am· Filed by Ben Zimmer under Language and gender, Language on the internets, singular "they"
As Eric Bakovic described here last year, Facebook uses they as a singular pronoun when the gender of the user is not known, leading to news feed items like: "Pat Jones added Prince to their favorite music." That's never been the most elegant use of singular they, since readers of these items tend to know the gender of Pat Jones, even if s/he hasn't told Facebook about it. Even more awkwardly, Facebook also uses themself when a reflexive pronoun is needed, as in: "Pat Jones has tagged themself in a photo." Well, now after some cross-linguistic difficulties, Facebook is trying to stamp out singular they by being more demanding about gender specification. A couple of weeks ago, it became clear that a certain number of Language Log readers feel that we don't devote enough attention to linguistic celebrity. "As a non-linguist", wrote Moira Less, "I must admit to having been surprised at how infrequently Chomsky is mentioned here (almost never?). I think he's only linguist who is world famous." I observed that Chomsky's name had come up in three posts in the previous month, and about 120 times since the blog began, which works out to an average of about twice a month. But in vain — Moira took this as confirmation rather than refutation, and others chimed in as well. 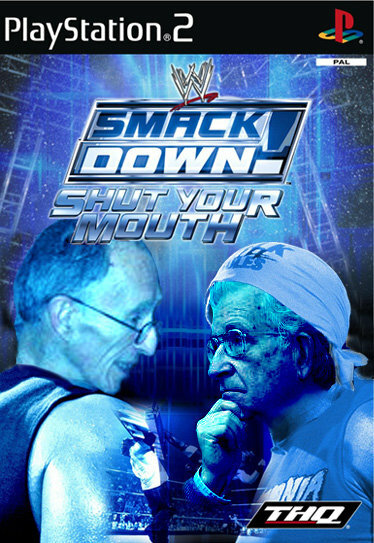 So I'm happy to be able to point you to a facebook group featuring not one, but two celebrity linguists: Labov vs. Chomsky—Ultimate Smackdown.